In the heart of Corsica, down the Popolasca snowy peaks, the 82 hectares of vineyard (202 acres) of the Domaine Vico overlooks the Golo Valley. The estate and the vineyard benefit of a unique location in the mountains surrounding the village of Morosaglia, in the northeastern part of Corsica, about 53 kilometers southwest of Bastia and about 35 kilometers northeast of Corte. Jean Vico established the vineyard in 1901. A pioneer of his time, he took the innovative but risky decision to plant vines at altitude, in a cold region, beyond the boundaries of vineyard planting in Corsica. Between the end of 1989 and beginning of 1990, François Acquaviva, Jean-Marc and Manu Venturi - two businessmen and an oenologist - then took over the Domaine and completely restructured it from the vineyard right through to the vinification process. Their pursuit for quality continues, as they experiment with specific vinification systems for each parcel of the Domaine. Having introduced "Agriculture Raisonnée" (sustainable agriculture) to the island of Corsica, they aim to produce earthy, concentrated, modern wines with traditional twist and Terroir oriented profile in the highest vineyard in Corsica. Characteristic to mountainous vineyard, the vines are planted on hill slopes ranging between 300-400 meters of altitude, far from the direct influence of the Sea and benefiting of high temperature fluctuation between day and night. This peculiar vineyard is separated in two big parcels: one near the village of Ponte Leccia and the other near the hilltop village of Piedigriggio. In both parcels, the produced wines are very complex, structured, elegant, and powerful just like their lands. They are rich without being heavy, and possess very good acidity and tannins. The parcel located near Ponte Leccia possesses rich, deep soil full of schist stones and rocks providing incomparable minerality to most wines produced there. The parcel near Piedigriggio contains more sandy-clay soils, which confer ampleness, fatness and richness to the reds. Totally modernized and renovated, the cave of the Domaine Vico is very efficient regarding its wine making capacity. Great wines can only be crafted from complex Terroir and skillful winemakers! And this wine is a very good example of it. Characterized by its combined concentration and elegance, it is the result of a rigorous selection in the parcels of this peculiar high altitude vineyard. The 3 grape varieties used to craft this Corsican red, come from vines planted on schistous soil, around 300 meters of altitude in the Golo Valley, resulting in a unique, rich, earthy, racy wine. Hand-harvested and carefully sorted, the grapes were destemmed and gently pressed to retain essential fruit flavors and diminish the extraction of the hard tannins from the grape. The fermentation occurred in stainless steel vats at controlled temperatures between 25°C and 31°C, for maximal extraction of the aromas and needed tannins for the structure. After full Malolactic fermentation, the wine rested in vat on its lees for a short period of time, then underwent a light filtration before bottling in order to maintain aromas, flavors, complexity and structure. 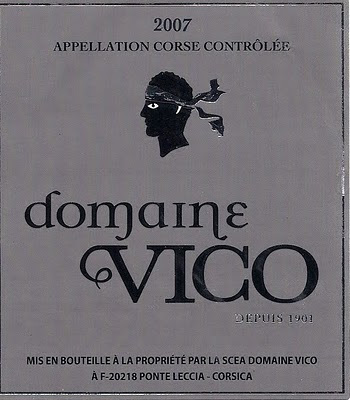 A blend of 50% Niellucciu, 20% Sciacarellu and 30% Syrah, 2007 Vico red exhibits a lovely red ruby robe with mauve nuances. It boasts Terroir oriented aromas of licorice, pepper, raspberry jam with notes of mint and leather nuances on the nose. The palate has a supple, fruity and luscious mouth feel with well balanced acidity and present yet integrated crunchy tannins leading to a licorice, tarry finish. Well crafted, intense, dark, structured, earthy and long, this is a wine to discover with hearty food, stews, grilled red meat and strong cheese.